“Creativity,” asserts Fawaz Gruosi, “means to take risks, to go against trends.” He lives and works by that credo. As the owner, designer and galvanizing force behind de Grisogono, one of the world’s most innovative couture jewelry houses, Gruosi has, in just a short time, revolutionized the way we look at and think of gems. “My aim is to do something new in each piece,” he says. In 1996, shortly after he founded de Grisogono (named in honor of a friend’s mother, the Countess de Grisogono), Gruosi came across the story of a legendary diamond in a history book: the Black Orlov. The 67.75 carat, ebony-colored stone had a mysterious, even lurid history: Allegedly stolen from its setting in a sacred Hindu statue in India, later owned by not just one but two suicidal princesses, and reputedly cursed, the stone had a dark, compelling beauty every bit as intriguing as the mythology surrounding it. 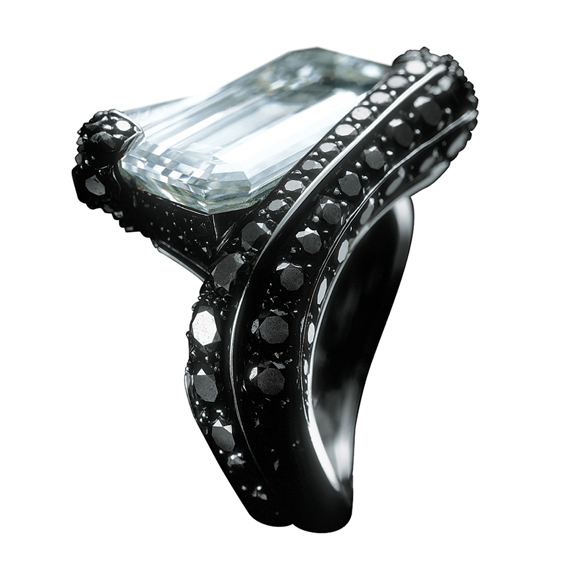 Fascinated by the diamond’s mesmerizing darkness, he decided to create an entire collection of black diamond jewelry. With the exception of the Black Orlov, black diamonds had been considered of little value in jewelry, thought to be imperfect and undesirable. But Gruosi looked beyond their plebian reputation and saw something more. He paired the mysterious stones with the pale luminosity of South Sea pearls (a style that remains much in demand today) and bold color combinations like deep green Colombian emeralds, the rich crimson of rubies, and the shocking, graphic contrast of white diamonds, creating a jeweled vision of startling originality. His intuition paid off handsomely: Today, de Grisogono is synonymous with the finest black diamonds, and more and more customers are being seduced by the dark side of diamonds, all thanks to Gruosi. Photos Courtesy of de Grisogono.